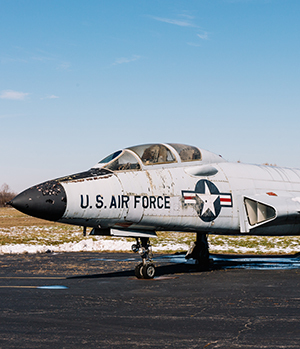 Due to a setback from a major fire, the Yankee Air Museum is still taking flight at Willow Run Airport in Ypsilanti Township. I n a study of fundraising prowess, mass-marketing appeal, and exhibit planning, it’s hard to compete with the resolve of military veterans and volunteers in their campaign to establish the National Museum of Aviation and Technology at Willow Run Airport, located in Van Buren and Ypsilanti townships. Launched in 1981 to preserve and share the history of Willow Run, where Ford Motor Co. built a plant in 1941 that would produce more than 8,600 B-24 Liberator bombers at a record pace of one aircraft per hour (55 minutes at peak production), the Yankee Air Museum set up shop in an historic U.S. Army Air Corps hangar at the airport. Although the museum has acquired other World War II-era aircraft, the purchase of a B-24 has proven elusive. “There are four B-24s left that were built at the plant,” Norton says. “Two are in England, and given what the aircraft meant in saving Britain during the war, we’ll never get those. After a fire in October 2004 destroyed the wooden-beam hangar, the Yankee Air Museum found itself in desperate straits. Lost were documents and artifacts including decommissioned munitions, World War II-era uniforms, tooling, equipment, and a small number of aircraft undergoing restoration. Saved were several larger planes: a Douglas C-47D Skytrain, known as the Yankee Doodle Dandy, a B-25D Mitchell that was similar to the aircraft Jimmy Doolittle and his flight crews used in a raid against multiple targets in Japan in 1942, and the B-17G Flying Fortress, dubbed the Yankee Lady. 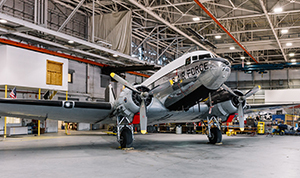 Following the fire, museum officials worked with Willow Run Airport and the Wayne County Airport Authority to set up an office in the main terminal building with the goal of restoring and enhancing the original mission of the institution. To beef up fundraising, the Michigan Aerospace Foundation was formed and, after a series of negotiations, the museum established the David and Andrea Robertson Education Center in a former schoolhouse built by Henry Ford and located on the airport grounds. Another building near the airfield was acquired to house existing and visiting aviation and historical displays, as well as a movie theater and a retail store. In 2014, the museum purchased a 144,000-square-foot section of the original bomber plant that had been spared from demolition. In 2018, the organization plans to open a permanent museum in the structure that will house all of its aircraft, exhibits, newly collected artifacts, and an educational center that will focus on science, technology, engineering, and mathematics. During a recent tour, work crews were outfitting the building with new enclosures (now since completed), and recently installed electrical service. Next up is water and sewer services. This section of the plant served as the final inspection area (still visible in the floor were two long cavities that once housed a chain-and-pulley system that propelled the planes along the assembly line). “We want to inspire students to learn what aviation is all about and become engineers and scientists, get into robotics, and become technology leaders,” Norton says. Last year, the museum hosted 10,000 students; staff expects the number of annual visitors will increase once the restoration is complete. To date, the foundation has raised close to $6 million for the project — it’s roughly a third of the way to reaching its goal of $18 million.